Life has been moving in the fast lane. And now that one of the paths is clear, it is time to share the joy with the world and invite one and all to be a part of the ongoing journey. My first film as a producer – Evening Shadows – is now on its way to premiere time. Evening Shadows is a journey of a gay son’s mother, the only person who can convert even the setting sun into a rising one… as much as it draws from my own life, it is more of a hope for the future. Come watch the movie and witness the unfolding life on the big screen! To stay up to date, like it on Facebook or follow it on Twitter. I woke up late. Much later than I expected to. And when I did, I had a hope against hope that I dreamt it all up. That’s the speciality of time. Doesn’t matter whether I want to turn it around, it just keeps marching ahead. As the day progressed, I witnessed that the emotions were remarkably divisive. Some were celebrating by lighting up the skies with fireworks. Some were mourning under the fire shower of those skies. Some just were a seated audience to the fires. None of it better or worse, until history determines what’s what. Pain is a very powerful sense amongst human beings. It replaced kingdoms with republics; tyranny with peace; oppression with sensibility; and hatred with love. Pain was what created the third force. And it was pain that defeated it so. Time is a remarkable teacher, healer and soother. Every wound gets healed. Of course some leave a scar, but with each scar, time teaches us how to avoid more. Though, sometimes, multiple scars are needed to make sure the original pain is reminded. As we embark upon the new journey, with no crystal ball in hand; let’s be aware that no matter what, time cannot be held onto. Patience, perseverance and preservation were, are and will be the foundations to surge ahead. Probably the triumphant trumpets were not of our choice. Maybe the incoming tempest is not of our making. Perhaps the thumping steps are not those of our conscience. 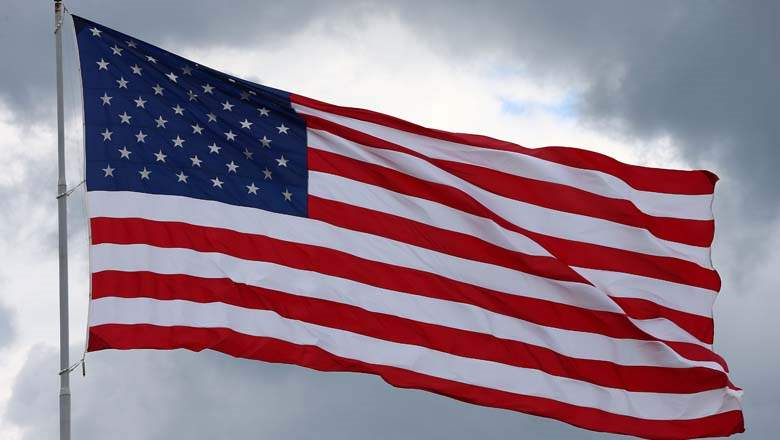 At the end, the only thing that matters is that we are each other’s keepers – E Pluribus Unum – out of many, one. The clouds may try their best, but the sun always shines. A king once assembled his advisors and asked them to come up with an inscription for his ring. His conditions were simple. In sadness, those words must uplift him. In happiness, those words must humble him. His ring was inscribed with the words – this too shall pass. As I was finishing off my sehri and looking forward to the day of fasting on a supposedly serene Sunday early morning, my television was playing the aftermath of yet another mass shooting in a town of the corner state. I waited for the press conference only to listen that details were to be revealed later in the day. After saying a small prayer for the departed souls and praying for speedy recovery of the injured, I took a nap. When I woke up, my phone was abuzz with news feeds. During those hours, the incident had become the most violent mass shooting in the United States of America requiring a visibly resigned and saddened President giving a speech describing a hate crime. I was not sure what I was supposed to feel. Yet another crime scene where a supposedly mentally unstable person gets hold of weapons of mass destruction and goes on a rampage at his will. A gay nightclub isn’t just a place to party, it’s a congregation for those shunned, those enlightened, those opened, those closeted, and those elated souls finding their solace amongst fellow humans. It is supposed to be a safe place amongst those who know and understand. Yet another moment when supposedly one cannot stand fellow humans expressing their love for each other. Not even a year has passed by that love was finally legalised in this country. Where all that mattered was love, not the ‘who’. Yet another time of bigoted detestation towards the faith. As if the current wave of misinformation wasn’t enough, the social media and the public media were filled with messages which confused, convoluted, concealed and contrived conflicting verses and versions. I am not sure what I am supposed to feel. I was born a proud gay person willingly following the tenets of Islam. For me, the conjunction was always an ‘and’. I never had any doubts of myself, my abilities and my reconciliation with my religion and my orientation. This has been the third consecutive year when I had been proudly fasting while religiously marching at the San Francisco Pride Parade. For me, it was a blessing to have the months of Pride and Ramadan overlap. This was the time when I get to be proud of the accomplishments of my LGBTQ community and be humbled by the fasting tenet amongst my Muslim community. A time where I get to be both of my identities with pride and humility. I wish I knew what to feel. It’s the year 2016. Artificial Intelligence is omnipresent. Virtual Reality is the market. And Driverless Cars are making headways. It’s the year 2016. Guns are easily accessible. Homophobia is richly prevalent. And Islamophobia is sailing high. As I ended my fast with my iftar, I couldn’t but wonder as to why humans are at the top of the food chain. There wasn’t a need of creating an enemy to the human race. They are self-reliant. The mention of Silicon Valley brings the images of the glass buildings nestled in the midst of large open spaces filled with highly-skilled ‘educated’ professionals. Silicon Valley also portrays the overwhelming presence of the Indian community. A community that I belong to. At least, legally, I still belong to. Today, I witnessed a shattering. A demise of my expectations from the Indian community I was born into. Trikone, the oldest South Asian LGBTQ organisation with its roots in Silicon Valley, was peacefully taking a stand to bring forth the attention to the missing LGBTQ rights. 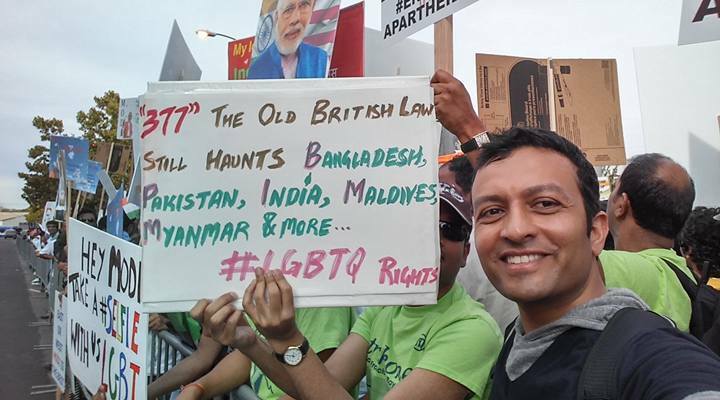 All I, being the chairperson of Trikone, did was to peacefully take a stand on the public grounds of the city of San Jose holding the sign – “377” The old British law still haunts Bangladesh, Pakistan, India, Maldives, Myanmar and more… #LGBTQ Rights. I was attacked. My fellow comrades holding equally neutral messages were attacked. My sign was snatched, broken and thrown. I was dragged, pulled out by my collar, held on my neck and was yelled at – you don’t belong here. The attackers were my fellow Indians. The attackers asserted their Indian majority status. Being a minority is not new for me. I was born in India. I was raised in India. I grew up in towns where I was taught not to mention my name out loud. I was told not to ask for what’s my worth. I was instructed not to question what’s been told. To add to the mix, I am homosexual. In addition to all of the above ‘not’s I had to add a whole lot of silence clouts. Setting foot in the United States of America, I assumed that I was away from all of Indian hypocrisy. The Indian majority set it right for me today. I was, am and will be a minority. Collecting myself off today’s moments, I am left with a haunting question – If the Indian majority, the ‘educated’ lot, standing on non-Indian grounds, can resort to such means to drive their point across; what is the plight of the minorities on the Indian soil? Here’s the beautiful paragraph written by Justice Kennedy of the Supreme Court of the United States. A new era begins in the history of gay rights.